Back in February I started realizing that kindergarten registration was coming soon. I was really uncertain…we plan to be in Nicaragua in time for school for Tate, but really, will it happen? Should I enroll him here as a back up plan or was that exhibiting a lack of faith? If we aren’t in Nicaragua yet, where will we be living? When does enrollment take place for wherever that is? I was feeling very overwhelmed with all of the uncertainties. I’m happy to say that just last week I completed Tate’s kindergarten application, and I anticipate hearing back from the school this month. We’re at 83.5% of our monthly need (but lagging a bit in one time costs) so I feel confident in our going by August. All this to say, I don’t have a back up plan. Moving to Nicaragua this summer is Plan A-Plan Z. And not just for school, but for everything. June 15th we will officially be homeless. My amazingly talented, super smart and hardworking husband has not had a single callback on any job he’s applied for here in the states. Normally this would be a huge blow for his ego but we choose to see God’s faithful provision for us to go as well as the lack of open doors here just a confirmation of our call. I’m excitedly terrified to see what God has in store. Knowing us, it’s sure to be strangely beautiful. 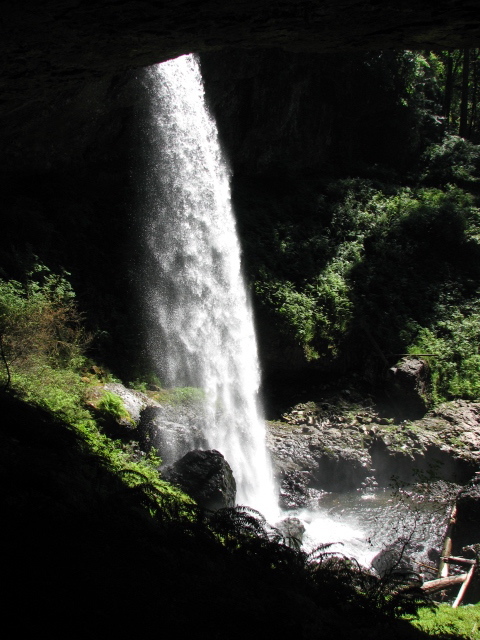 (This picture is taken from the back side of Silver Falls in Oregon. I thought it was strangely beautiful as well). Praying for your walk of faith each day. Thank you, Sean. We covet your prayers.